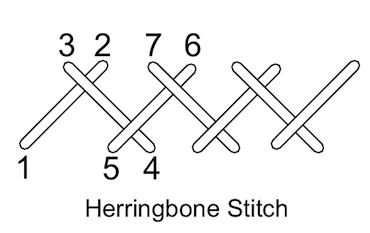 Herringbone stitch is effective, quick to work, and versatile. A popular use is in decorating seams in crazy quilting, as in the photos further down this page. But it is functional, as well as decorative, and can also be used for hemming garments. Did you know that you can stitch it on the wrong side of a fine fabric, to create shadow embroidery? Here the color shows through, giving a pastel effect to the filled areas. I suggest practicing on a scrap of fabric, where you can draw three parallel lines for guidance. When working on a quilt block, the center line would be the seam you are decorating. Bring your needle through from the back at 1, below the seam line. Insert the needle at 2 and bring it up again at 3, above the seam line. Take the needle down at point 4 and up at 5. (Your needle will face back, towards the start of the stitching, for each stitch.) Continue in this way across the row. Try to pick up the same amount of fabric each time, and to keep the same gap between each stitch. This will form an even row of crossed stitches. You will see in the next photo that I misjudged the placement of one stitch which spoils the effect. 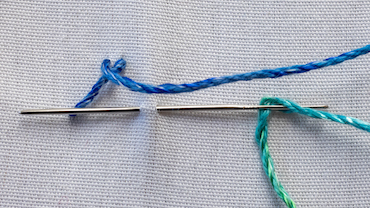 By threading a different colored thread under the existing stitches you get interlaced herringbone. 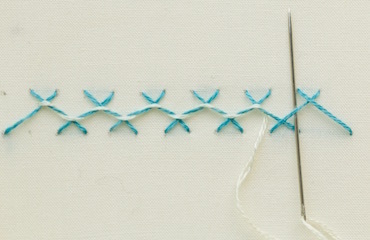 The photos show how the direction of the needle changes for each "stitch". 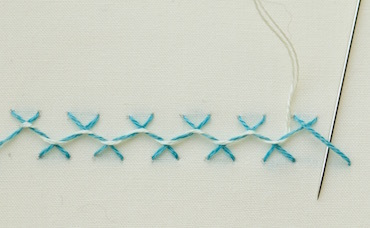 These stitches do not penetrate the fabric apart from starting and fastening off the thread. 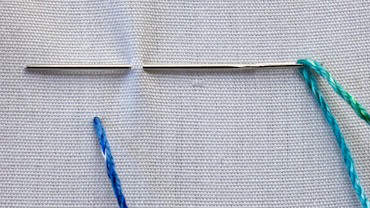 A blunt tapestry needle, therefore, makes working the interlacing easier and reduces the risk of stabbing your finger! The next photo shows a second row of herringbone worked between the first row, in a different color. I also added detached chain stitches to decorate the seam further. You could get even fancier by adding fly stitch "leaves" to make these into little flowers.